Sacramento Peak Observatory is a facility of the National Solar Observatory (NSO), located 2,800 meters up in the Lincoln National Forest of the Sacramento Mountains, near Sunspot (65 kilometers southeast of Alamogordo), New Mexico. Its largest instrument is the Richard B. Dunn Solar Telescope, a vacuum tower telescope, 108.5 meers high – only the top 41.5 meters of which rises above ground level – with a 0.76-meter entrance window and a 1.6-meter main mirror. Other instruments include the John W. Evans Solar Facility, equipped with a 0.4-meter coronagraph and a 0.3-meter coelostat, and the Hilltop Dome Facility, which operates a number of solar patrol cameras and test cameras. 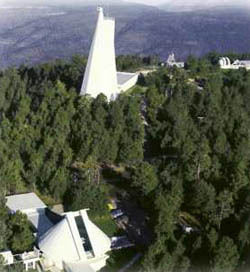 The Observatory was founded in 1949 by the U.S. Air Force Cambridge Research Laboratories and became part of the NSO when that body was founded in 1984.